Suitable for connected with washing machine or mop pool, flat handle independent switch. High purity brass main body, resistance costing, single hole wall-mounted installation. With G1/2 inch washing machine special connector in outlet.Ceramic cartridge, Quality guarantee time:5 years no leakage. 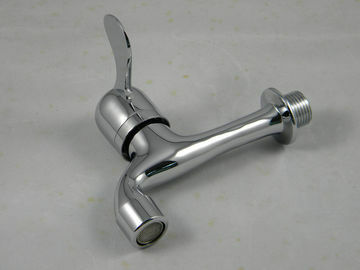 Washer taps, washing machine faucets, shower flow diverter, home faucets, household faucets etc. Supply laser LOGO on faucet’s handle or body, paste products label on our neutral color box or blister packing with our brand printing or OEM brand printing, MOQ for OEM of color box printing is 1000unit. Individual Package: Individual package and 12 units double packed with carton.